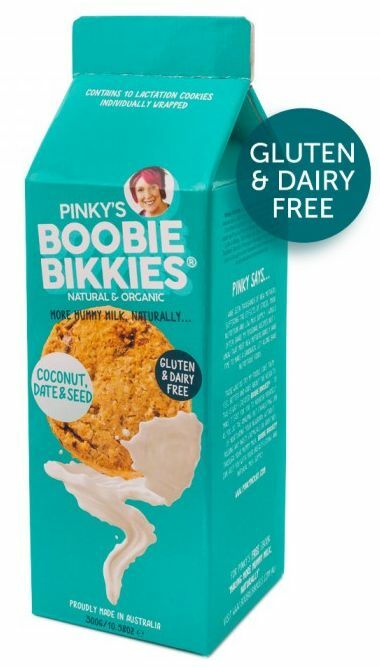 As boobie bikkies contain only natural and organic ingredients and contain no preservatives, the shelf life for the Boobie Bikkies variety is 3 months. The more milk removed from your breasts, the more your body is signaled to make. Breast milk flavour changes depending on the foods and spices the mother eats and studies show that babies suckle longer and obtain more milk when milk is vanilla flavoured. Rich in B group vitamins and iron to give you sustained energy, oats also contain saponins (a sweet soap-like substance with immune stimulating and antibiotic effects). Saponins may influence production of hormones from the pituitary gland. This may aid production of both prolactin (milk production hormone) and oxytocin (which helps milk flow), both of which are made in the pituitary gland. Rich in B group vitamins, minerals, folic acid and protein, Brewers' Yeast is also a rich source of chromium – an essential part of glucose tolerance factor (GTF) through regulation of carbohydrate metabolism and insulin function. Niacin (vitamin B3) is also an integral part of GTF and is present in Brewers' Yeast. Rich in B group vitamins and iron, oats also contain saponins (a sweet soap-like substance with immune stimulating and antibiotic effects). Saponins may influence production of hormones from the pituitary gland. This may aid production of both prolactin (milk production hormone) and oxytocin (which helps milk flow), both of which are made in the pituitary gland. (Jacobsen 2011). Eggs in Boobie Bikkies come from happy, hens roaming free in paddocks. A nutrient rich, natural, whole food, eggs are a source of high-quality protein with the ideal balance of amino acids – this will provide you with strength and stamina and help repair your body after the marathon effort of growing and birthing your beautiful baby. All B vitamins are found in eggs, including vitamins B1, B2, B3, B5, B6, B12, choline (important for building the memory centre of your baby’s brain), biotin, and folic acid as well as essential fatty acids, especially omega 3 fats (important for healthy nervous systems in you and your baby), Vitamins A, D (egg yolks are one of the few natural sources of vitamin D, essential for strong bones and teeth), E, and K, calcium, iron and zinc. Eggs are also an excellent source of certain minerals that can sometimes be difficult to obtain from other foods such as selenium and iodine. According to Ayurveda, cinnamon will help to increase secretion of breast milk and the Chinese variety is used as a galactagogue. Cinnamon is also used in Brazil and Peru as a spice for lactogenic foods (Jacobsen 2011). Babies are reputed to like the taste so it may encourage effective breast emptying, which of course will stimulate milk production (the more milk you remove, the more milk your body will be signaled to make. Cinnamon is also helpful in keeping blood sugar levels steady by improving sensitivity to insulin. Quinoa, a gluten free seed (it’s not a grain), contains saponins (a sweet soap-like substance with immune stimulating and antibiotic effects). Saponins may influence production of hormones from the pituitary gland. This may aid production of both prolactin (milk production hormone) and oxytocin (which helps milk flow), both of which are made in the pituitary gland. (Jacobsen 2007). Quinoa is a complete protein, containing all eight essential amino acids and is rich in vitamin E, selenium, potassium, magnesium, zinc, iron, folate and riboflavin. It also has prebiotic properties to feed the beneficial bacteria in your gut and, being easily digested, your body can readily access the vitamins and minerals in quinoa. Organic coconut butter/coconut to boost your energy and increase nutrient levels in your milk. Lactogenic and a source of instant energy without insulin spikes, coconut/ coconut oil contains healthy, healing, medium chain triglycerides (MCTs) and, like human breast milk, is rich in lauric acid, a powerful anti-microbial fatty acid that protects the immune system of the fetus and newborn. A study published in the American Journal of Clinical Nutrition has shown that lactating mothers who eat coconut oil and other coconut products, have significantly increased levels of lauric acid and capric acid in their breast milk, creating milk rich in health promoting nutrients. With a wide variety of nutrients ranging from magnesium and manganese to copper, protein and zinc, pumpkin seeds are nutritional powerhouses. Pumpkin seeds, are an excellent source of plant-based omega-3s, as well as a rich source of tryptophan, an amino acid (protein building block) that your body converts into serotonin, which can help boost prolactin (milk making hormone) levels. Breast-milk is a rich source of tryptophan that supports the development of serotonin receptors in your baby’s gut, so it’s an important nutrient for breastfeeding mothers. Revered as a sacred plant of women in ancient times, dates contain Tryptophan, a precursor for serotonin (our feel-good neurotransmitter) that supports lactation by increasing prolactin levels. Dates are a rich source of energy, dietary fibre (do your poor postnatal bowels need a boost too? ), and natural sugar - milk production removes sugar from the blood, that we need to replenish. This is why breastfeeding mamas crave sweet things, but it’s better to stick with naturally sweet foods than fill up on refined sugars. Dates are also an excellent source of vitamins and minerals including iron, potassium, calcium, manganese, copper, magnesium; B-complex vitamins- pyridoxine (vitamin B-6), niacin, pantothenic acid, folate and riboflavin -as well as vitamin and vitamin K.
Sunflower seeds packed full of healthy unsaturated oils, protein and fibre, these powerful little seeds are an excellent source of B vitamins, particularly niacin and folate, and contain magnesium, phosphorous, potassium and zinc with smaller amounts of iron and calcium.